• Free consultation of up to (60) minutes with a highly-trained Fraud Resolution Specialist™ (FRS). • Assistance with restoring identity and good credit. • Outline to avoid future ID theft. • Contact information for the three major Credit-Reporting Agencies. • Legal referral to an attorney. 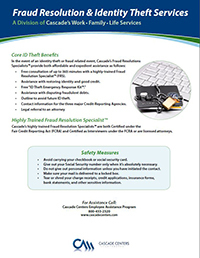 Cascade’s highly trained Fraud Resolution Specialists™ are both Certified under the Fair Credit Reporting Act (FCRA) and Certified as Interviewers under the FCRA or are licensed attorneys.